Blazes are Nether hostile inhabitants. This kind of being have the head on a central structure made from smoke and particles. Its body is made from three rotatory pieces. Each one of these ones its made from four vertical bars. Its skin is yellow and its eyes brown. 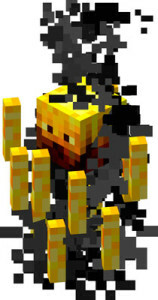 These creatures move easily through the lava, the same way as a fish would do with water. As it is a fire mob, water and snow balls will damage it. It flyes just a little bit moving its body almost touching the floor. When a Blze detects a player its body starts to flame, meanwhile its rotatory structure starts revolving faster, it starts shooting fire balls to the player. They don’t have very well target practice but its attac is quite dangerous. Blaze will only appear to the Neather fortress. They spawn when when a player is coming and they are able to naturally auto generate, even tough there isn’t any spawner.